SHUT DOWN FOREVER if it got out. hard to keep it from you. If you’re sick of being lied to by an industry whose only real concern is its own bottom line, read on… and discover the shocking facts about one of the most important areas of your life. This letter is about information certain people DON’T want you to know. These facts and many, many more have been consciously, systematically HIDDEN from you...by a diet and nutrition industry eager to keep people hungry for the next big thing. The "miracle cure". The "quick fix". The key to feeling satisfied — and never deprived — WITHOUT overeating. How often do you keep on eating because you think you're still hungry, only to feel uncomfortably full, even sick, after you're through? It's not because you have a lack of willpower or an out-of-control appetite. There's a very simple thing you can add to your diet that will eliminate that problem forever. Once you do it, your brain will STOP signaling you to eat excess food. You'll always eat just the right amount naturally, and feel pleasantly satisfied, never deprived. How to turn a “bad” food into a “good” food... instantly! You can make whatever you eat significantly healthier and more nourishing. It's easy, once you understand the secret to doing it. The AMAZING impact your environment has on the way your body processes food. The same exact food can be processed in completely different ways by different people ... even by YOU on different days. Certain environments can turn even a piece of broccoli into metabolic sludge. Others can make your body burn through any food, even a doughnut or fries, with lightning speed. Of course not! It would mean that you wouldn't need them or their pricey programs, plans, pills, powders, or anything else. Because you would already have everything you need to achieve the body you want. You see, your body is naturally, elegantly designed to achieve a healthy, ideal weight AND, at the same time, fully engage in and enjoy the experience of eating. And MUCH MORE —naturally, enjoyably, and INCREDIBLY fast? Most diet and nutrition programs out there essentially "deactivate" this inborn ability by steering you into imbalanced, even dangerous, eating habits, and setting up a reward/deprivation dichotomy that is destined to end in failure. But I've helped thousands of clients and individuals climb back from the negative physical, emotional, and psychological effects of these programs and finally attain the weight and state of health they'd been striving for. I can ORDER NOW and SAVE $20! more nutritionally sound way to get the body and heath you want. It isn't a new kind of diet. As a matter of fact, as you'll discover in the next few minutes, being healthy and fit has far, far less to do with what you eat than you've been led to believe. It's not some new sort of exercise regimen. I actually advise my clients to drop the word “exercise” from their vocabulary - and their routine - altogether (and when they do, the resulting changes blow them away). It isn't a dangerous drug or a radical surgical procedure. In fact, it's the most natural, noninvasive process in the world. I've put together a comprehensive program for complete metabolic transformation, based on more than 20 years of research and practice in the fields of nutrition and psychology. My clients very often come to me in a situation you may be able to relate to. They're following all the rules of healthy living: eating well, exercising, avoiding all the things they've been told are bad for them. Yet they're undernourished, uninspired, and overweight. It happens because what you eat is only half the story of good nutrition. The other half is HOW you eat. You’ve probably said things like, “I’ve got a gut feeling ...” or “I can’t stomach the thought ...” countless times in your life. But you may not have realized just how right you were. Expressions like these reflect the fact that the digestive system has a brain all its own. One that is intimately connected to the rest of the nervous system, yet also an independent locus of command. Scientists have discovered that this “brain in the belly”— known in the scientific world as your Enteric Nervous System, or ENS — contains over 100,000,000 neurons. That’s more than the number of nerve cells in the spinal cord. The complex network of neurons and neurochemicals that make up your ENS can sense and control events in the digestive tract. They can also, remarkably, sense and respond to events in other part of the body. What’s more, researchers have found that the flow of neural traffic from the ENS to the head-brain is much greater than from the head-brain to the ENS: it’s not your head that tells your digestive system what to eat and how to process it ... it’s the other way around! What all of this means, in a nutshell, is this: Digestion is NOT a strictly physiological, mechanical process. It is powerfully, profoundly connected to and influenced by neurological processes—that is to say, by your MIND. Consequently, everything that affects your mind—from your physical environment to your current emotional state to your self-image, memories, past experiences, and belief paradigms—has a direct and often very surprising impact on how your body processes food. That's the missing link that is keeping too many people from enjoying vibrant health and true physical fitness, in spite of all their efforts — while others seem to “break all the rules” of good health and nutrition, yet still manage to look and feel great. It's also why so many people find that they can't stick to a diet or exercise regimen for any substantial length of time. Maybe you've been there. And if you have, you've probably put the blame on yourself: You're lazy, you're undisciplined, you lack willpower, you have a slow metabolism, you like all the wrong foods and hate all the right ones. In fact, nothing could be further from the truth. They have a diet they thoroughly enjoy and that includes foods they love, even so-called “bad” foods. They DON’T "exercise" or engage in any physical activity that they find unpleasant or burdensome. They DON’T have to summon superhuman willpower to maintain a moderate diet. They DON’T experience deprivation or resentment related to food. Most importantly, they are healthy, happy, and at a stable, optimum weight. The ONE SIMPLE CHANGE you can make that will immediately change your body for the better. It has to do with the food you eat, but I can just about guarantee it's not what you think! If you do nothing else but this, you will quickly and profoundly improve the way you look and feel. It's so powerful ... and it's SO easy. The REAL secret to how the French stay thin. It ISN'T chocolate, cigarettes, or - as many people believe - red wine that keeps the French thin and heart attack free despite their rich, "unhealthy" diets. I'll tell you the other ingredient they add to almost all their meals that DOES make the difference. The emotion that virtually shuts down the metabolic process. It's not the food you're eating that creates fat - it's THIS feeling! And it's a huge part of many people's nutritional life. Eliminate it from your emotional makeup, and you'll give your metabolic engine an incredible, permanent rev. I'll show you how. How to eat whatever (that's right, whatever) you want for two weeks, and look and feel better than you do now. Maybe better than you ever have before. That's the promise I'm making you when you follow the simple plan I share in Session 6. It’s the two-week Pleasure Diet you have to experience to believe. Skeptical? Just try it and see! Nutritional myths you’ve been raised on ... SHATTERED. "You are what you eat"... right? Nope. "Eat right and exercise if you want to lose weight"... true? Uh-uh. I'll relieve you of some of the most misunderstood, misinterpreted, and flat-out WRONG ideas about health, weight loss, and well-being - and give you the scientific evidence that proves them wrong. To replace them, I'll share 12 unexpected and absolutely true nutritional facts! Is your artificial sweetener actually making you FAT? There's a biochemical reaction caused by the ingredients in many artificial sweeteners that causes fat buildup, and it could be happening in YOUR body. If you're a fan of Equal, Sweet 'n Low, Splenda, or any other sugar substitute, you need to hear about this. Are you creating a self-fulfilling prophecy of poor health, weight gain, and inertia? If you've got any of these five beliefs operating in your consciousness (and many people have ALL of them! ), then you probably are. The sooner you find out what they are and shed them, the sooner you'll rewrite your nutritional destiny and achieve the ideal weight and state of health you dream of. Eat the foods that are right for YOUR body! When it comes to healthy eating, one size does NOT fit all. Which foods, in what combination, work best for your unique physiology? This simple exercise will help you find out. And all of that is really just the start. In this program I upend just about every myth and misconception you (and all of us) have been fed about health, weight loss, diet, and nutrition. You may be shocked by some of the things you'll discover in Mind/Body Nutrition. There are things you may not even believe at first. But everything I share has been scientifically researched and proven over and over again. "10 Secrets to Nutritional Empowerment"
You won't be deprived. You won't feel resentful. You won't have to give up anything you love to eat. Yet incredibly, almost magically, you'll become healthier, more energetic, and - yes - thinner and more fit than you are now. Amazing! Do THIS instead! You're guaranteed to LOVE it, and once you start doing it, you'll get into shape faster than you ever have before. Why? Because it has a direct healing effect on the most important - and most abused - organ in your system: the one that determines whether your metabolism is fast and efficient, or slow and sluggish. It's perfectly safe ... available in any health food store or online ... and will have an absolutely transformational impact on your physiology. The eight-glasses-a-day dogma could be doing you more harm than good. You might need more ... but you also might need far less! This CD will tell you how to figure out exactly what your body's hydration needs are so that you can maximize the remarkable power of nature's perfect beverage. There's no more powerful detoxifier in the world than your body's own climate-control system. Too many people needlessly put themselves through a grueling workout to get the benefits. But you don't have to! This CD reveals the NO-impact (and totally enjoyable!) secret to rejuvenating your blood cells and supercharging your metabolism. These secrets will change your body, your health, your whole life! You can get them all FREE when you order Mind/Body Nutrition today! I guess some people may be genuinely happy counting fat grams, net carbs, calories, protein grams, servings, portions, and all the rest of it. But in more than 20 years as a nutritional researcher, counselor, and author, I've never met such a person. The people I've met simply want this: to be fit, healthy, and happy about their bodies ... and to be able to truly enjoy food, without guilt, shame, or negative physical consequences. If that is what you want too, then I want to invite you to achieve that ideal state, through a process that is simple, natural, logical, and completely in tune with your body's innate instinct toward health and equilibrium. Just click on the link below to accept Vic Conant's exclusive offer of Mind/Body Nutrition: Increase Your Energy, Eat Without Stress, and Transform Your Health. As soon as you begin listening, you'll discover dozens of simple actions that will immediately impact and transform your metabolism. You will see the results of these changes on the outside, and you'll feel them on the inside. Marc David is a pioneer in the field of mind/body nutrition, and one of today's most respected authorities on the science and psychology of food. His groundbreaking, life-changing work has been praised by world-renowned health experts, including Dean Ornish, Christiane Northrup, Mark Hyman, Larry Dossey, Paul Hawken, Anne Louise Gittleman, and many others. In this powerful LIVE session, you'll hear Marc at his energized best, before an enthusiastic audience of people who, like YOU, are looking for a simple, natural, and empowering way to create a healthy lifestyle. This FREE CD includes a dynamic Q&A session, in which Marc answers some of the most common questions about weight loss, exercise, food choices, and healthy living - with answers that are anything BUT common. You don't want to miss it! 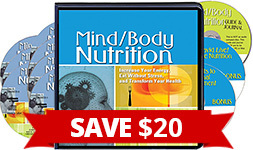 Order Mind/Body Nutrition with confidence. Keep Mind/Body Nutrition ONLY if it positively changes your relationship to food and the way you look and feel in a way nothing else has. Otherwise, simply return it anytime within 30 days of your purchase for a full refund of the regular program price. It really is possible to transform your biology, your body, and your nutritional destiny. A new metabolic you is waiting to be born. Welcome it now, by ordering Mind/Body Nutrition at a special limited-time discount today. I look forward to joining you on the journey! P.S. If you've followed the fad diets without lasting success ... if you feel frustrated and confused by the conflicting nutritional information that you're bombarded with each day ... this program is going to give you the clarity, insight, and practical tools you've waited for and deserve. It's easy to follow, and it is guaranteed to yield changes in your body and being that are meaningful, deep, and lasting. Order Mind/Body Nutrition NOW, and find out how enjoyable and rewarding your relationship with food can be! If I am not completely satisfied with the results I experience, I'll send the program back within 30 days for a full refund. No questions asked.